Cincinnati is unquestionably a sports town. With pro baseball, football, soccer and hockey plus D1 college sports, fans have their pick of teams to throw their support behind — and their pick of athletes to admire. 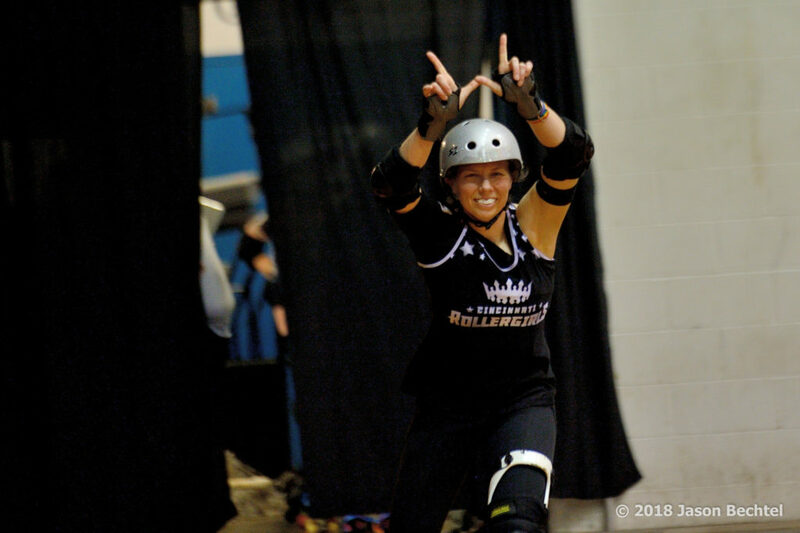 That makes it all the more remarkable that Cincinnati Rollergirls skater Wheezy was voted Cincinnati’s No. 3 Overall Local Athlete by the readers of Cincinnati CityBeat in 2019 (CRG was also voted the city’s Best Amateur/Semi-Pro Team for the ninth year in a row). So how did someone with no previous experience playing a team sport — who named herself Wheezy because she has exercise-induced asthma — end up on a list right behind Cincinnati Red Joey Votto and Cincinnati Bengal A.J. Green? Read on to find out. How does it feel to be voted Cincinnati’s #3 Overall Local Athlete? I was honored to be nominated in the first place! It’s really amazing to be recognized for doing something that you love and something that you work really hard at. And it’s even better because it means that Cincinnati sees us as real athletes, athletes that are right up there with Joey Votto and A.J. Green. It’s so humbling and so validating. Wheezy and her younger sister. 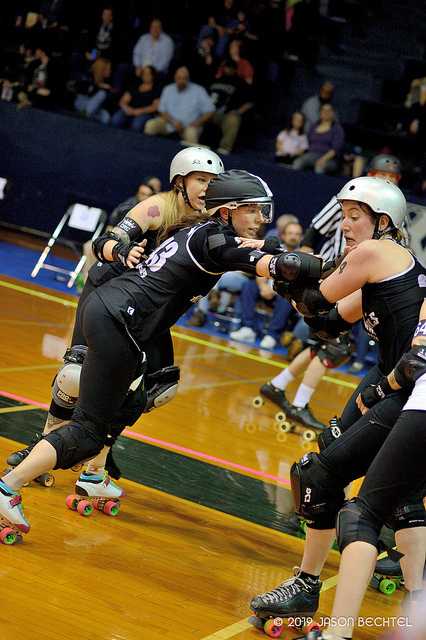 What was your athletic background before you started playing roller derby? Roller derby is the first team sport I ever played, with the exception of one subpar season of soccer in second grade. When I was little I did gymnastics and dance. 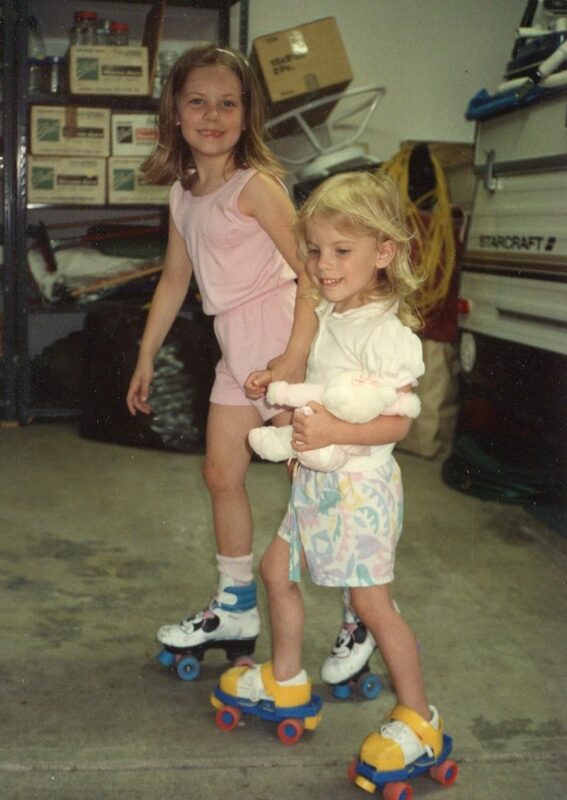 My sister and I also took artistic roller skating classes, but she was definitely the graceful one. When I got into high school I snowboarded. Growing up I never really considered myself athletic or an athlete. I didn’t really find that until I started roller derby. How did you first find out about roller derby and get involved with CRG? I had a friend who moved down south and started playing roller derby there. She was always posting on social media about it, how fun it was, what new things she’d learned. Finally I was like, OK, this sounds awesome. I wonder if we have that in Cincinnati? So I Googled it and we did, and tryouts were in two weeks. So I emailed and signed up, having never seen a game. I went home to Cleveland and got my old elbow pads and knee pads and my dad’s bike helmet. I borrowed a pair of skates that were way too big, and I tried out. At the end of the tryout, I was like, well that was fun. Then I got an email saying I had made the team. Wheezy jamming in a 2010 Cincinnati Rollergirls game at the Cincinnati Gardens. What was the learning curve like when you first started playing derby? When I started we had no boot camps, there was no Monday Night Derby, no Sheep Ewe [new skater training], no scrimmage-ready test. I just showed up and was immediately in it. It was hard, everything went fast, I didn’t understand what I was supposed to be doing, but I loved it. Every practice I tried to go in with a goal. One of them that I remember was I wanted to skate as fast as Hannah Barbaric for our 40-second sprint during warmups. It took forever, but finally, I did it. Then when I left practice, I tried to think of one thing that I had learned or that I had done well on, just one success. When you first start, it’s really easy to get lost in all the things that you’re doing wrong. I think what kept me going was setting little goals, then celebrating when I accomplished something. You just plug along and day by day, you get better. In 2015, you suffered a potentially career-ending ACL injury but committed to recovery and were back in action 5-1/2 months later. What do you do now to help reduce the risk of (re)injury? I work with an amazing trainer, Donnie Kalb, at the Mayerson JCC. He knows my knees are a concern, so he’s constantly watching me to make sure that when we’re doing all the crazy training stuff that my form is good, that when I’m jumping I’m landing safely. I also do a lot of rehab with him. When things start to hurt or feel strange, he’ll slow down, have me do stretches or exercises designed to fix things. I also try to be really aware of what my knees are doing during practice. If I find myself using bad form for anything, I’ll train it by myself when we have free time on skates, just making sure to correct those bad habits and build muscle memory for the right stuff. When we’re in-season I cross-train just to maintain strength and cardio. We beat each other up pretty well at practice, so my cross-training is to make sure that I’m keeping my general conditioning and rehabbing anything that could turn into a nagging injury. In the off-season, I go harder. I train more times a week and I really try to build muscle. For me, that’s not something I can focus on during the season. You were originally primarily a jammer and now you usually play the pivot position — which means you sometimes become the jammer. Do you have a preferred position? What do you like best about each? Jamming has changed so much since I started. It’s really almost a different position now. I don’t know that I like one better than the other. Jamming is still really exciting. You get out there with the star and anything could happen. You get this huge rush of adrenaline and you have to use it, but also stay in control of what you’re doing. Blocking is great too, though. When you get on a roll with your pack-mates and everything just flows, it’s magic. We use a lot of strategy, and that coordination with your pack is so intense. Wheezy jumps the apex to pass opposing blockers during a 2016 Cincinnati Rollergirls game at the Cincinnati Gardens. Bont hybrid carbon boots (love them, I got a new pair exactly like my old ones, same colors and everything), Powerdyne Reactor plate (but apparently it’s the first version they ever made so parts are getting scarce), morph wheels for the floor at Schmidt Fieldhouse, Ezee Fit booties, Sully shoulder brace, DonJoy knee brace, Rector Fatboy knee pads, 187 elbow pads, S1 helmet with face shield (but I also use a Triple 8 without shield). 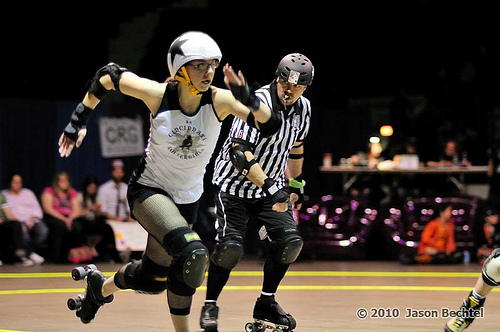 In addition to skating, you’ve held a variety of leadership roles in the league, from the leadership team to our training committee to a member of CRG’s coaching staff. How would you describe your coaching style? As a coach, I’ve really been trying to empower more people to contribute ideas. Derby is such a complex sport, and it’s changing every day. We have a ton of incredibly smart, talented players, training committee members and bench coaches, and we need everyone on board to figure out how to move forward, especially in a way that capitalizes on our talents. I try to pose questions at practice so that we can all figure out the answers. I also try not to say “never” or “always,” at practice. If you think you can make something work, try it. That’s how we evolve. But if it’s not working, you have to be open to adjusting. Also, I’m really lucky to have a great co-coach in Grimace. He’s a good partner. He stays really calm but has a funny sense of humor. I think we rely on each other to work through what to do in various situations. It helps that we have the same basic values, but we come at things differently. What’s been your favorite or most memorable derby moment to date? So this is probably the place where I’m supposed to recall a glorious victory and tell you about that. But really, one of my favorites was during a scrimmage at practice at least five years ago. For some reason, Kitten Kicker was jamming and I was blocking. She came flying into the pack super fast and back blocked me to the ground. I slid on my hands and knees and she slid behind me. As we finally came to a stop, one of the refs looked down at us, blinked a few times, then called “Wheezy, low block!” Now both Kitten and I knew that that was not the case and we burst out laughing, I skated away to the box and she continued her jamming rampage. We still laugh about it to this day. Do you have any game day rituals or superstitions? On game day, I like to clean. I do dishes, laundry and straighten up. It makes me feel better to leave the house with things organized. It’s probably like, if my house is in order, the game will be too! I teach and practice yin yoga. It’s yoga for your bones and ligaments. It helps me keep mobile. I’m really competitive and I like to win. I’m inspired by all the amazing derby that’s happening all over the world. I love seeing a cool move or strategy and trying to figure out how we can do it or use it. I also love seeing my teammates succeed, that’s the coaching part. It’s really amazing to be a part of helping someone learn something. I just get so proud of them, haha. What advice would you give to beginning skaters? Don’t wait for people to give you what you want or need. Ask for it, make it happen. Don’t be afraid to make mistakes, make mistakes boldly and learn from them. I know this sounds like a bunch of inspirational quotes, but it’s really true! Wheezy makes her signature W with her hands during skater intros at Schmidt Memorial Fieldhouse.